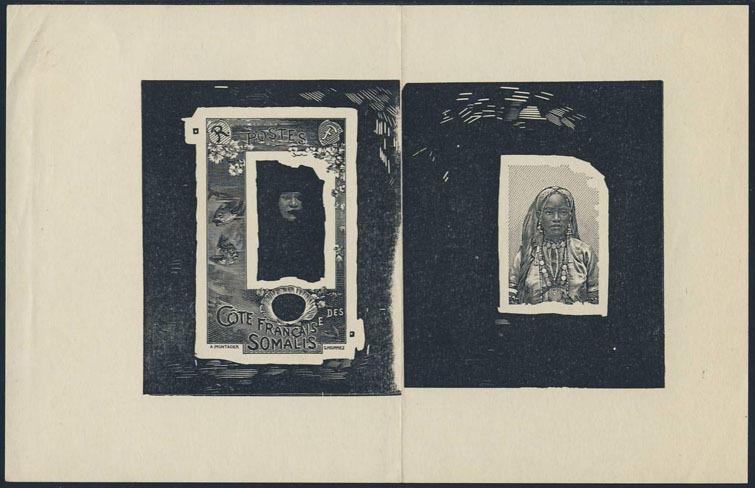 17868 EA SOMALI COAST (1915) Somali girl*. Monochrome die proofs of vignette and stamp in large format (measuring 21 x 13.5 cm - designs measure 15 x 9 cm.). Scott type A22. Very rare! Folded in middle between vignettes. 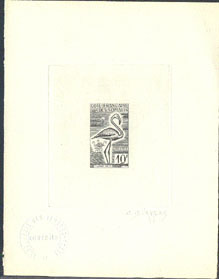 526 EA SOMALI COAST (1960) Ibis*. Die proof in black signed by the engraver DURRENS. Scott No 285, Yvert No 301. 3525 EA SOMALI COAST (1960) Flamingo*. 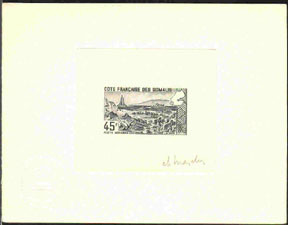 Die proof in black signed by the engraver DURRENS. Scott No 283, Yvert No 297. 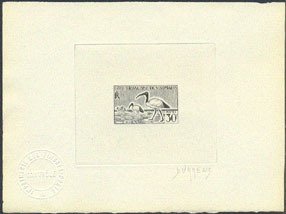 17832 EA SOMALI COAST (1965) Abbe Lake*. Die proof in black igned by the engraver MAZELIN. Scott No C37, Yvert No PA43. Only 28 exist. Rare!